The Birdsville Big Red Bash is not only a unique and memorable music festival in one of the most Iconic locations in Australia, it's also an outback experience like no other. The 40m high Big Red Dune acts as a spectacular stage backdrop. The Big Red Bash paints itself as not only a festival, but a journey, which is an integral part of the whole experience. The patrons experience everything the Australian outback has to offer, all while rocking out in the desert to Australia's best artists. Who are the people behind Birdsville Big Red Bash? 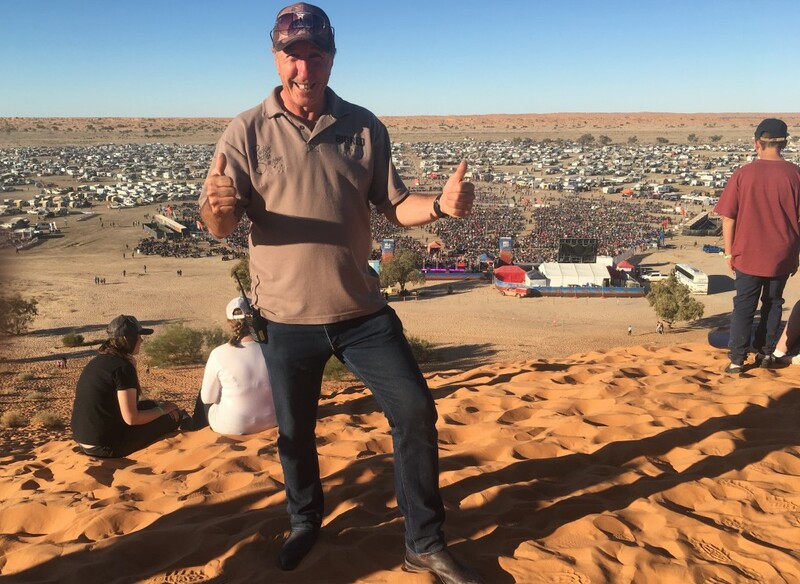 In 2016 the festival moved out of the Simpson Desert and into Birdsville itself due to pre event rain making the normal site at the Big Red Dune unsuitable. The main oval opposite the iconic Birdsville Hotel became the concert venue, with thousands of campsites spread around the outskirts of town. It was the first year of a new event we introduced called the "Bashville Drags" where patrons get dressed up Pricilla Queen of the Desert Style and compete in a run raining funds for RFDS. The inaugural run was a lap around the streets of Birdsville which proved to be a hilarious spectacle. I'm lucky to be in the business of music festivals, especially in such a remote location. The festival is much more than a 3 day event, but a bucket list item for many. It creates a ripple effect and reaches far further than Birdsville and the Shire. The amount of lives that are impacted in a positive way is astonishing in itself, from individuals to businesses to whole communities. It gives me motivation to make this event everything it can be and keep providing so many benefits. The huge multi-day music festival that is the Birdsville Big Red Bash started in 2013 with an intimate sunset performance atop of the big red sand dune by John Williamson as an entertainment piece for the competitors of Big Red Run (A multi-day charity run through the Simpson Desert). The small performance drew a crowd of just over 500 people. At this stage we had no idea just what would grow from it. We discovered a niche that no one knew existed. From this unusual idea we built upon it every year, to enable it to become what it is today with over 9000 people attending in 2018. What’s your ultimate vision for Birdsville Big Red Bash? My vision for the business is to provide the ultimate outback experience and to become the #1 outback event in Australia, providing flow on benefits throughout the outback. A testimonial about Birdsville Big Red Bash? The atmosphere that comes from living inside the world's most remote music festival on the edge of the Simpson Desert is unbeatable. You feel like part of the family of 9,000 creating an outback town for 3 days in such a beautiful, remote location which is breathtaking.